At Nanette Lepore’s studio, that Fashion Week magic starts with the actual work of patternmaking, cutting and sewing. 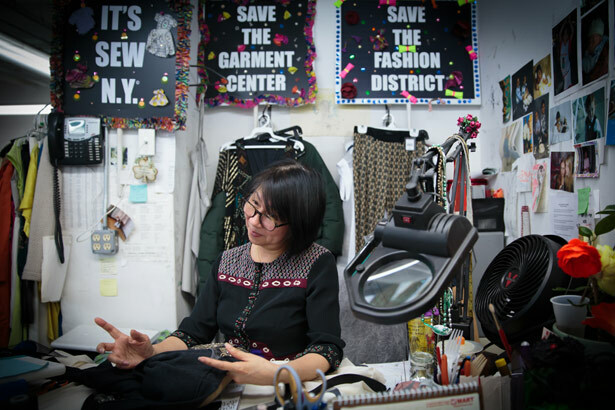 In the heavily outsourced world of fashion, the design of garments often happens deep inside secretive brand headquarters in the United States. Meanwhile, the physical construction occurs thousands of miles away, frequently at subcontracted factories with substandard working conditions. At the headquarters of Nanette Lepore in New York City, the process is far more open and intimate. 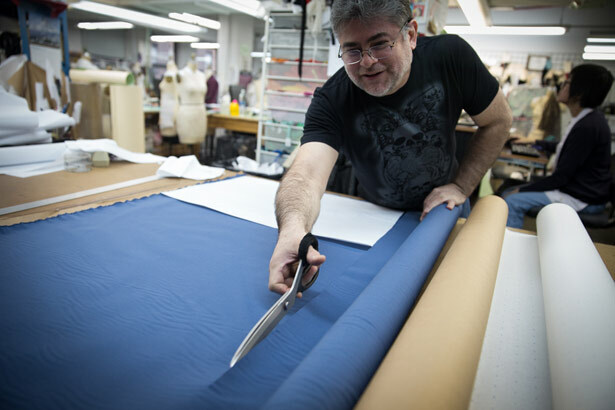 Last week, at the lauded womenswear designer’s fifth-floor studio in the Garment District, dozens of workers with a variety of highly specialized skills were busy tweaking and perfecting Lepore’s upcoming Fall 2014 runway show for this year’s Fashion Week, including a pattern-maker from Guangdong, China, a sample sewer from Marine Park, Brooklyn, and a print designer from Youngstown, Ohio. Here, it’s crystal clear just how integral the process of making actual things is to the often-rarified world of fashion design. Nanette Lepore is well known for her commitment to New York City’s Garment District, and an afternoon spent in her studio makes it hard to imagine her clothes made any other way. Ideas rapidly went from sketches to patterns to full-fledged garments in hours, instead of the weeks or months it would take to receive a sample from China. New designs evolved or were shot down on the fly, harnessing the creative process in real time and relying on skilled production jobs that are a far cry from the dumbed-down assembly line garment work of our imaginations. Only about seventy-five of the myriad designs flying around the studio on this one particular afternoon will make the cut into the show. After Fashion Week, the collection will be further edited, until finally just the very best, most memorable and wearable designs will go into production. Even then the work stays close by: over 80 percent of Lepore’s clothing is manufactured in New York City, much of it within ten blocks of her studio. The theme of Lepore’s latest collection is “handcrafted,” an appropriate homage to the ecosystem of highly skilled professionals responsible for engineering her designs. Though we never see them on the runway or mentioned in the pages of magazines, these pattern-makers, sample sewers, cutters and the like help ensure not only that garments fit together perfectly but that they are functional and flattering to the human form. As they calculate where a seam needs to go or if a chosen fabric will drape properly, some of the faces photographed here will help determine which designs are truly ready for the lights and scrutiny of the runway. Your theme for this season is handcrafted. To what degree has handcrafting been lost in fashion? It was the first thing to go in the US Garment Center [Midtown New York’s Garment District]. When I used to go in the factories in the old days, there would be a table of ladies like Sue, our hand sewer. She’s such a rarity… Now you can’t even find someone to sew on a snap. It’s crazy. But there would be all these finishers and they would be sitting in front of heaps of garments. And that went over first because it wasn’t mechanized. You’re working on a pleated skirt at the moment. Explain how this skirt might be different than a pleated skirt for sale in a chain store made overseas? It’s going to fit nicer if we make it here because we’re going to be able to check on the fitting…. In China, a lot of people let the factories make all their patterns and they don’t work on a mannequin like we do. You saw my pattern-makers working on the body forms. Everything [overseas] is flat, to spec, so you lose the shape. We know it’s unusual to produce full runs of clothing in the United States, as you do. But are runway collections we see at Fashion Week made overseas? A lot of them get their samples out of China. And what they do is they order like four times what they need, because you don’t know what you’re going to get…. I couldn’t imagine waiting and then a week before the show, you’re frantic trying to make them look better. You’re reliant on an ecosystem of workers to produce collections. Why is there so much focus just on designers? Even our government thinks that. They thought that designers could deal with everything on their own. It’s commerce. They understand that the automobile industry needs factories. I don’t understand why they don’t see that the clothing industry needs factories as well. Do you think the made-in-America renaissance is here to stay? Onshoring is really happening and it’s not happening because it’s a trend…. Prices are going up in overseas factories and people are getting in trouble for working in factories that aren’t safe. But people are also understanding that when you do the technology and the production and the manufacturing of an item, you know the future, you know what’s coming…. We need our factories so that we can be ahead and advance for what’s coming next. Did you work in the garment industry before you came to work with Nanette Lepore? In China, I worked in the same kind of thing in the factory and with fashion. Like wholesale garments. How did you learn pattern-making? When I started with Nanette, I was the sample-maker for showing, and then I went to FIT [Fashion Institute of Technology] to learn pattern-making and the computer. And then Nanette gave me a chance to do pattern-making, assisting… I learned more and Nanette gave me a chance to do it by myself. I’m not just an assistant anymore. The fashion. I’m crazy about the fashion. It’s very lovely, and I love doing patterns for the skirts and the dresses and the tops. When you send your patterns out to factories in the neighborhood, what happens next? Sometimes when you make a beautiful sample and you send it to the factory, they’ll mess up. And we have to check the sewing—that it’s good—and check the lines…. Or sometimes the seam allowance is not the same, and you have to make sure it follows our patterns. Are you wearing Nanette Lepore? This [sweater] is Nanette Lepore. I think it’s from last year. A sample size zero. Nanette sometimes gives us free samples…. They’re very lovely. And they fit me, because I’m a size two. What’s the most important tool for a cutter? What was the industry in New York like back in 1984, when you first started? Did you ever think the industry would totally die out in New York? Oh yes. That happened to me. I went to work in the food industry because it was hard for me for a while to find a steady job…. And then somebody called me about Nanette. And I asked, “Does she do everything [in New York]?” And they said, yes, so that was the place I wanted go to work. Salary, money. People think, oh, you work in this industry, you’re a cutter, you don’t make any money. But actually it’s not that way. A good cutter, with experience, can make a college graduate’s salary, easily. Do you feel skilled at what you do? Yes. You have to have a lot of experience to know how to communicate with pattern-makers, with designers, and you have to know if something is possible. You have to tell people when something cannot be done. People think that pattern-making would be boring or that it’s math or geometry or something. But to me it’s actually the creation process, and it allows me a lot of creative freedom. Ultimately I’m working with the designer on what she wants, but I’m the once that gets to make it look that way. Do you feel invested in each piece? It can be very emotional. Sometimes you work really hard on something and you get really invested and for whatever reason, the stylist won’t like it or they change it. And you’re just, like, crushed. What’s working on runway collections like? Some shows are easier than other shows, but it’s always this journey of wills—the battling wills. There are so many cooks in the kitchen and there are so many opinions in here and getting everybody on board is a challenge. Was there a point when you thought the New York garment industry would totally die out? I think I should be more afraid, and maybe I have a false sense of security because I’ve been here for so long. But what I’m afraid of is that, with time, the industry will shrink and shrink, and more people will look overseas with their pattern-making too, because I know that’s happening. 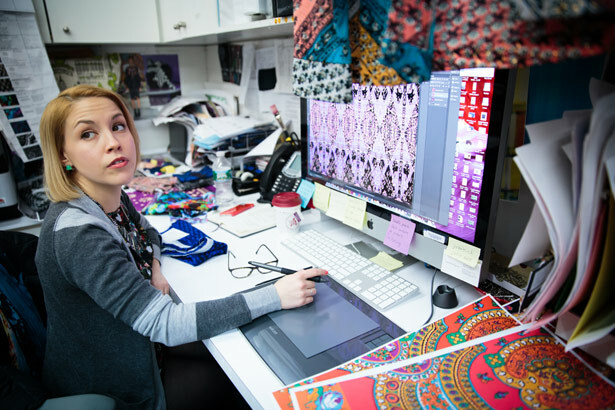 How does using the computer and digital tools tie in to the collection’s handcrafted theme? Some of the prints we’re doing, they started off with a hand embroidery and are interpreted into a print. We scan some of it in. It’s this play on taking something handcrafted and manipulating it and reproducing it and making it your own thing. What would you say is the biggest misconception about what you do? I don’t think people realize no one is alone in a vacuum or off doing their own thing. We’re all working together…. It’s nice that everyone has their specialty, and, sometimes, you’re so in it, that you don’t see something obvious. And then someone will come in from another department and say, oh, why don’t you try this? Has working in the New York industry changed the way you shop? It depends on what it is. You still need those T-shirts, but I think people are becoming more and more aware of where their clothes are coming from, and I think people want quality over quantity. There’s a sustainability about New York garment district fashion that you don’t have with overseas companies. You grew up in Youngstown, Ohio, a city once known for its manufacturing. Is there any connection to what you do now? Almost everybody on my father’s side of the family worked in the steel mills…. All those steel mill factories closed down, and it’s really a ghost town now, and there’s nothing bringing in the immigrant communities. It’s totally changed the entire landscape and the culture, and I think we’ve experienced the exact same thing here in the Garment District. What drew you to pattern-making? It’s a continuous learning challenge. Like, I will still be learning things twenty years from now. There’s so much variation. I could learn new things about pants or dresses or whatever. What do you think the biggest misconception is about what you do? What’s it like working on a runway collection? This is the exciting part and this is also the most stressful part. We’re on a twenty-day run of working every single day right now, but this is where the magic happens. This is why we do what we do. Everyone seems pretty calm. Isn’t there supposed to be screaming and hair pulling? 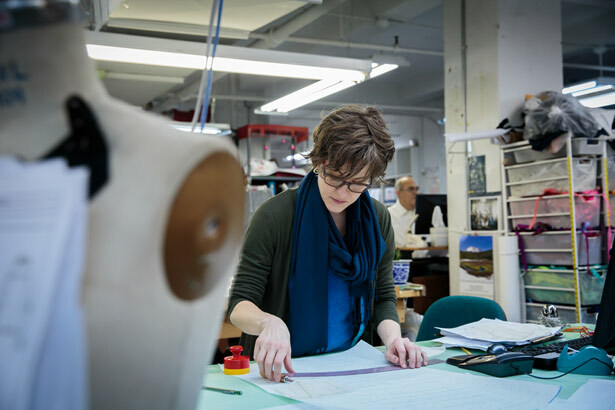 Do you think it’s important to have skilled garment jobs in New York? Yes, I do specifically because it’s such a technical thing and it really is very specialized. Essentially pattern-makers are the mechanical engineers of the fashion industry… I’m really proud of the fact that I work at a place where most of our stuff is made here in the City. That’s huge for me. I’m from the Midwest. I come from a factory town. Do you think growing up in a factory town has influenced you in other ways? I get very confused by people who don’t make things. I’m like, “What do you do with your time?” Where I’m from, we make things. If you have that ability, you can make everything you need. You’re that much closer to being self-sufficient. How did you learn how to do hand sewing? I saw my grandmother; I learned from her. All the other older people were doing it. I liked to sit next to them and watch them. [My grandmother] taught me a lot about, like, knitting, crocheting. Twenty years. Before, I was doing bridal. Always in New York. I love it. I love to do the beading and embroidery. Everybody says I have to have patience, but I think it’s calm and relaxing…. It makes me really happy. Because when you see the finished product, well, you know what I mean. There aren’t very many hand sewers left in the Garment District. Is there a future for the trade in New York City? The younger people are not doing this. It takes a long time. That’s why if I have a chance to show the young people, like if we have interns here, I love to show them how to do it. So we can pass this on to the younger generation. Is what you’re doing a skill? I think so, yeah. You have to love it…. Some people, sitting all day, doing the same thing, one bead, by one bead, not everybody can do it. Do you think it’s important to have a garment industry in the United States? Of course, come on. If not we lose everything, it’s going to go overseas.